- Gold fever caught fire on Friday as weak monthly jobs data raised the specter of economic deterioration and put out nascent dollar strength. - Expectations for the Fed's near-term monetary policy plans were also shaken, likewise serving gold. - Yet, I am still suggesting gold be avoided, and even sold on strength that could take the precious metal higher over the very short term. - The reason is that I see the latest jobs data as a remnant of the weakness we saw in Q1. - Data for Q2 have been mixed, but with consumer relative data in retail sales, consumer spending and home sales showing strength, I see the economic situation improving. Gold fever is a certain mania that strikes gold prospectors and causes them to act irrationally and to build up great hope where it may not be appropriate. Gold fever does not take much to strike, and in this case, it got quite the kick start with the apparent economic change on Friday. Gold gained thanks to the poor nonfarm payroll data reported for May. 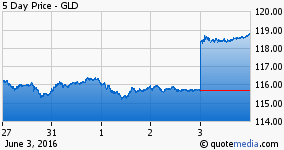 The SPDR Gold Trust (NYSEARCA:GLD) was up $3.19, to $118.86, or 2.8% for a nice day's gain. It benefited from severe dollar weakness on the bad economic data and expected change to the Fed's plans. Gold prices could even touch new highs on the fever if Janet Yellen doesn't serve a dose of medicine on Monday in Philadelphia. Nevertheless, I still say avoid gold and here is why. The SPDR Gold Trust opened gap-higher Friday thanks to the premarket release of the Employment Situation Report for May. The data showed only 38K nonfarm payrolls added in May, versus economists' consensus expectations for 158K. The news was so poor, stocks opened significantly lower along with the U.S. dollar. 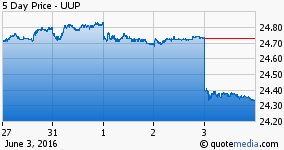 The chart here is of the PowerShares DB US Dollar (NYSEARCA:UUP), which is a layman's means of investing in the dollar. It tracks the value of the U.S. Dollar Index, which was off 1.8% on Friday. That is a big move for the dollar. 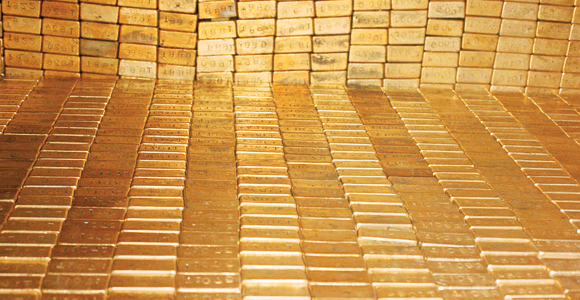 The dollar was down for two important reasons that also matter for gold. The first is the implication the weak job growth figure has for the state of the U.S. economy, and the second is the implication it has for the U.S. Federal Reserve's monetary policy plans. If the jobs data are truly reflective of a deteriorating economic situation, then the dollar should depreciate in value. And if the Federal Reserve will hold off tightening monetary policy or if it might even ease policy because of the economy, then the dollar value again likely depreciates. In both cases, gold prices would rise. The story of relative economic strength and dollar appreciation have been what have weighed against gold prices, especially since the release of the Federal Open Market Committee (FOMC) meeting minutes, which indicated the Fed was about ready to raise interest rates. If that story has changed, then gold should see the pressure that has stood against it relieved. But has it? The reason I am still suggesting investors avoid gold is that I believe the economy is not in bad shape. We have received mixed data over the last few weeks. Just this past week, Personal Income & Outlays data showed a 1.0% pickup in consumer spending in May. Both new and existing home sales rose to extraordinarily strong levels of annual pace at last report. May motor vehicle sales came in a little light, but I think I've shown that was for anomalous reason. The Chicago PMI was also weak, but I believe that is a regional issue tied to the ailing energy sector. These are, in my opinion, the remnants of the poor first quarter. I expect that as more data flows, it will make a case for an improving economy in Q2, and clarify that this employment deterioration is lagging from Q1, when a negative feedback loop plagued economic data. I expect this will at least help to rebuild a case for a Fed rate action by its July meeting, and maybe even for June still. If my presumptions are correct, then the dollar should rebuild its strength and gold should give back these gains. But the U.S. economic outlook is not the only factor weighing in the dollar's favor and against gold for American investors. The specter of Brexit and a still vulnerable and suspect euro-zone area economy also weigh in the dollar's favor. Likewise, the possibility of further terrorism for Europe and the weight of its refugee crisis pose economic threat to that region more so than to the U.S. Thus, given my view that Friday was not indicative of the current situation for the U.S. economy or for the Fed outlook, and my scenario for pressure against the euro, the dollar should recover and strengthen. In that environment, gold must give way. Friday's data and their impact to the dollar and to gold could strike up gold fever for the very short-term, but I still believe it's a mistake to buy gold now. The precious metals sector is one that sometimes draws emotionally charged opinions. Investors should know that I share many of the general opinions they do for the very long-term, and that I have always suggested investors maintain stakes in the physical commodity for asset diversification and wealth protection purposes. Still, that does not affect my analysis of the current situation and relevant expectations for gold prices and relative securities. I want investors to know that I am unbiased and had a long view and positions in gold relative securities this year from January into mid-February, before altering my view in mid-February on the changing environment and after gold's extreme gains. Also, gold was my only long position and recommendation during the financial crisis. All that said, I suggest current avoidance of long positions in gold relative securities, including in gold miners and relative ETFs. Aggressive and speculative investors may even consider taking short positions against gold strength using derivative securities or relative ETFs for the possibility that the economic and Fed outlook I expect play out.